How Do I Become a Wedding Planner? This is one of the most common questions we get. While we are not currently hiring for lead planners, we always want to point you to the best path. To be a wedding planner requires many skills. You must be creative, very organized, flexible, able to prioritize, a problem-solver, a people-person and much more. It is not an easy profession, although it definitely has its rewards and perks! We highly recommend you begin by working as an intern for a planner or complete a training program. This will allow you to see what planners do on a daily basis, as well as at a wedding, to help you decide if this is the career for you. To really get started, do both! 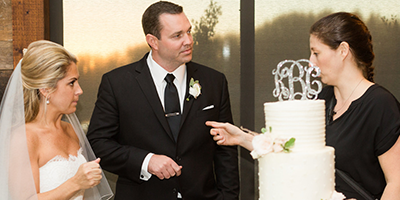 We recommend the certification program through the American Association of Certified Wedding Planners. For more information on their program, go here. Wedding planners are always keeping an eye out for wedding day help. We offer training for those who want the skills to be a fantastic assistant, whether for Each & Every Detail or any wedding planner organization! Those who work as a venue coordinator or assistants to photographers and DJs have also found our training to be extremely useful. Our program is 16 hours and teaches you how to prepare for the wedding, what your lead planner needs from you, and lots of little skills such as how to pin flowers and cut cake. You can sign up as an individual interested in the program or you can request we customize this program for your company and train your group as needed. For more information about our program and to let us know you’re interested, click the button below. Each & Every Detail offers a non-paid internship for individuals seeking knowledge and experience in the wedding industry as a planner and coordinator. As one of the few wedding planning groups offering internships in the Dallas/Fort Worth area, we are proud to present a detailed and planned approach to instructing and mentoring our interns throughout the time they are with our firm. Our interns learn how it all comes together behind the scenes and help out with projects to aid our clients and our company. Interns are required to complete 300 hours (working a minimum of 3 shifts per week during our normal business hours) to accomplish goals set forth in this program. (These requirements may be adjusted to fit college internship requirements.) If you are interested in this unique opportunity, please click the button below to fill out our questionnaire and submit your resume.